Mayor Itthiphol Kunplome awarded 100,000 baht in scholarships and handed out the first of more than 1,200 tablet computers to Pattaya first graders. Flanked by top city officials and bureaucrats, Itthiphol presented 100 students selected in August by the Mahakit Phaisal Foundation with 1,000 baht stipends Nov. 15 at city hall. The ceremony also marked the start of distribution of Pattaya’s allotment of 1,282 Chinese-brand tablets purchased by the national government under Thailand’s “One Tablet Per Child” initiative. Prathom 1-level students from Pattaya’s public schools will be able to keep the tablets for two years after parents secure them with a paid deposit. 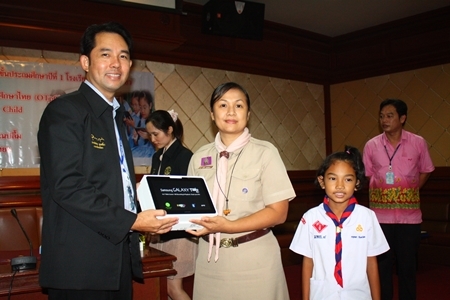 Mayor Itthiphol Kunplome presents one of the new tablet computers to a teacher and student from Pattaya School No. 1. Prime Minister Yingluck Shinawatra proposed the tablet plan as part of her election campaign last year. The government this year purchased 860,000 seven-inch “Scopads” from supplier Shenzhen Scope for $81 each as part in a government-to-government purchase. Pattaya was one of the last cities to receive its allotment. Pattaya teachers in October were trained to teach courses with tablet use in mind, as the Ministry of Education has loaded the tablets with reading, writing and storybook programs. The city purchased 35 tablets for first-grade teachers. 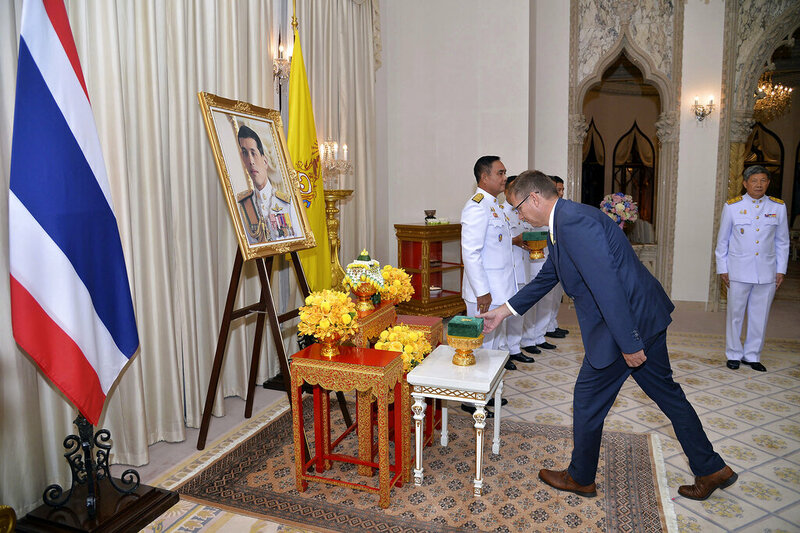 “Pattaya is happy for children who have received the tablets from the government since the government has given importance to education and have issued concrete policies,” Itthiphol said. He added that seventh-grade students will receive their own tablets next year. “The good point of having a tablet is that children will have the stimulation and interest with extra attention in learning from the colorful information,” said Aaporn Rajsinghho, principal at Pattaya School No. 8. She said schools would make sure the tablets are charged and offer places for storage for kids whose parents didn’t pay the deposits to take the devices home. Previous articleSandy to take on Schumacher & Vettel!